Rooftop Reviews: John Lennon at 70 - Imagine! This photo was taken by my late friend Michael Held in the spring of 1974. It was the March of Dimes Concert in Central Park. Michael and I had gone to volunteer and help move some sound equipment around. 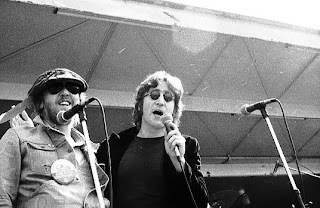 Michael, as always, had his camera with him, and took this great shot of John, along with Harry Nilsson, just as they took to the stage. They did not perform, just spoke to the crowd. They had been watching the crowd enter the Park from Lennon's apartment in the Dakota, on Central Park West, and on a whim, decided to go down and "have a look." I can't imagine what direction Mr. Lennon's music would have taken had he lived past the age of 40. But his message of Peace, though still unfulfilled, resonates as strongly today as it did 30 years ago. When you go out today, do something nice for someone. Say hello to a stranger, give a buck to the homeless guy you usually pass by. I bet that John would love it if you do.